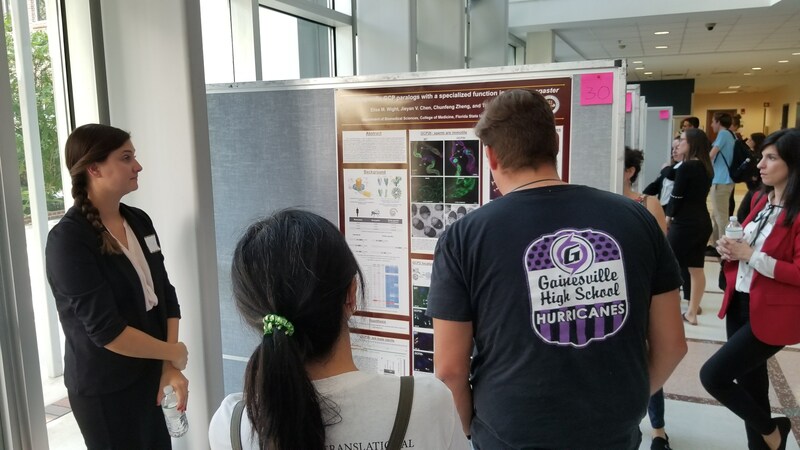 The Sunshine State made good on its name on a clear, late September day as over 160 scientists at all career stages from across the state of Florida and beyond gathered at the University of Florida (UF) in Gainesville for the Second Annual Florida Translational Cell Biology Symposium (FTCBS). 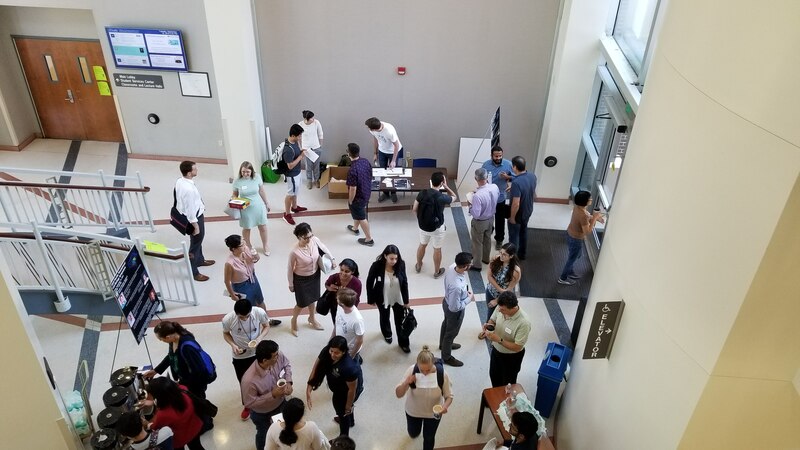 Notably, this event was organized exclusively by a committee of graduate students from UF, Mayo Clinic, Florida State University (FSU), and University of Central Florida (UCF). With generous support from ASCB’s Early Career Meeting Grant, the students coordinated a free, one-day symposium aimed at “bridging the gap between basic cell biology and translational research.” The event was truly a showcase of how an understanding of fundamental mechanisms in cell biology undergirds positive patient outcomes in a clinical setting. More story below the images. 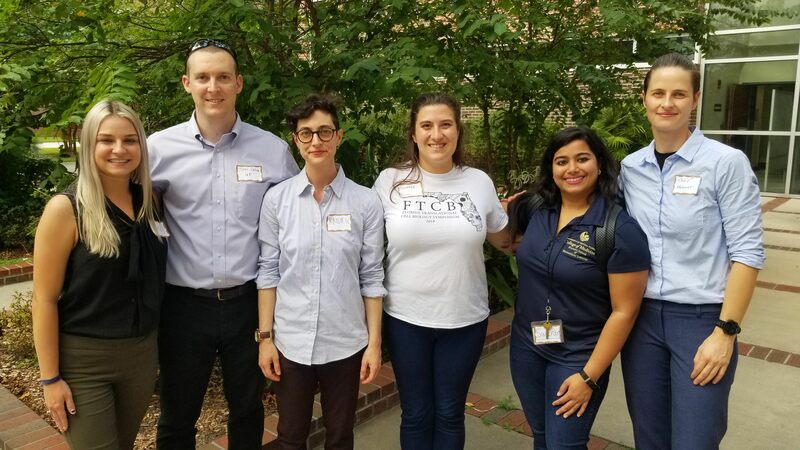 Over 160 scientists gathered at UF for the Second Annual FTCBS in late September 2018. Elise Wight (FSU) presents her research, winning first place in the poster competition. Abstracts in the afternoon poster session highlighted how an understanding of fundamental mechanisms in cell biology undergirds positive patient outcomes in a clinical setting. 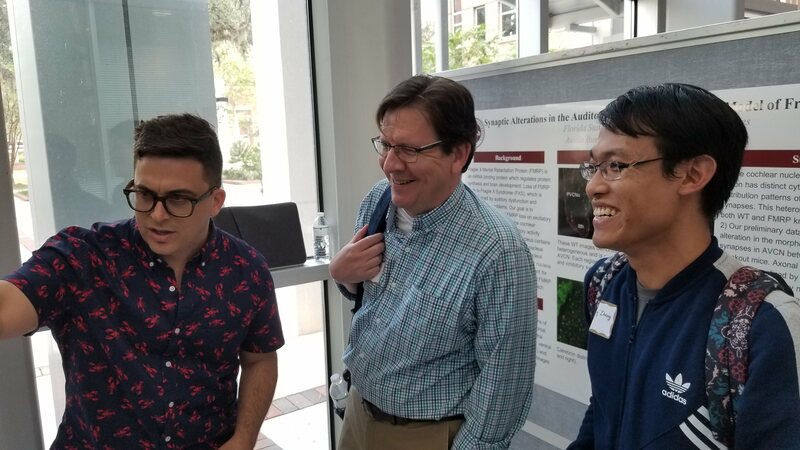 From left, Eric Vitriol (UF) and Keynote Speaker Jim Bear (UNC at Chapel Hill) visit Yiming Zheng’s (FSU) poster. 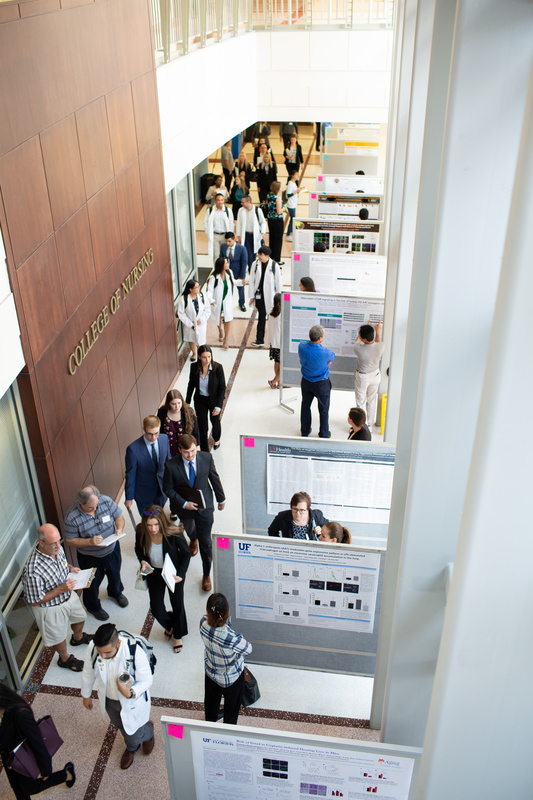 Research talks and posters by students, postdocs, and faculty highlighted the diversity of research in the state while unifying everyone under a common passion for science. I smiled as I walked amidst the posters that afternoon and heard exclamations of newfound common interests and related research questions. Surely several collaborations resulted from that day! Along with three faculty talks, six graduate student abstracts were selected for brief, 12-minute lectures. Seeing students at my career stage produce such excellent work was encouraging and made me proud of the community of which I am a part. Over the lunch break, two career development discussion groups were held. At “The Academic Elevator Pitch – Breaking the Structured Presentation Format,” participants learned to boil down their research into understandable, memorable nuggets that could be quickly explained. At the second discussion group, “Opportunities for Women in Biomedical Science,” I was pleasantly surprised to see an increase in male attendance from the previous year. A panel of two female/wives/mothers/…/scientists discussed balancing the various roles that not only women but we all must manage as we develop ourselves and our careers. It was a good reminder to seek balance in life as well as mentors who will offer the support we all need. By far the highlight of my day came with the keynote address given by James E. Bear from the University of North Carolina (UNC) at Chapel Hill as he displayed his lab’s work unraveling the underlying mechanisms of actin-based cell motility. During his talk, I felt less that I was sitting in a science lecture and more that I was at some well-anticipated movie premiere. The excitement with which he presented his lab’s data was contagious and made me remember the enthusiasm that sparked my love of science. The day ended with an informal reception at a local food establishment—a well-deserved time of relaxation from a packed but good day. Eric Vitriol (UF) joked that last year was the worst year for this symposium, and in a humorous way, he was right. Both last year and this year were incredibly enriching, educational, and enjoyable experiences, but if I had to choose between two equally good things, I would have to say that this year was the best so far. I can’t wait to see what the students have in store for another successful event next year at the Third Annual FTCBS!